In the fall wasps and bees become sluggish and easier for our pets to sometimes find. They are more likely to even seek the warmth of our homes or catch a ride in on bags. 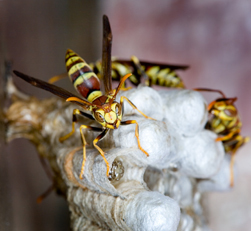 Wasps especially at this time of year can be even more aggressive, resulting in increased stings and bites to our curious pets. Multiple stings are dangerous. Most of the time, an insect sting is just painful and irritating. Getting stung several times, or stung inside the mouth or throat, is dangerous and requires a trip to the veterinarian. Bee and wasp stings are poisons. It’s not the small puncture wound that causes the sting's pain, but the small amount of poison that is injected. Most of the time pets get stung on their faces or feet from investigating a stinging insect too closely. A sting the sensitive nose is particularly painful. Some animals may even get stung on the tongue or inside their mouth or throat if they try to bite or catch an insect. These stings can be dangerous. The subsequent swelling can close an animal’s throat and block the airway. Watch for allergic reactions. A severe reaction can be caused by a large number of stings or by an allergic reaction. Never administer oral medication without checking with your veterinarian first. Some pain medication can be toxic to pets. Maintain a watchful eye on your dog. Observe your dog closely after the sting incident to ensure an allergic reaction doesn’t develop. 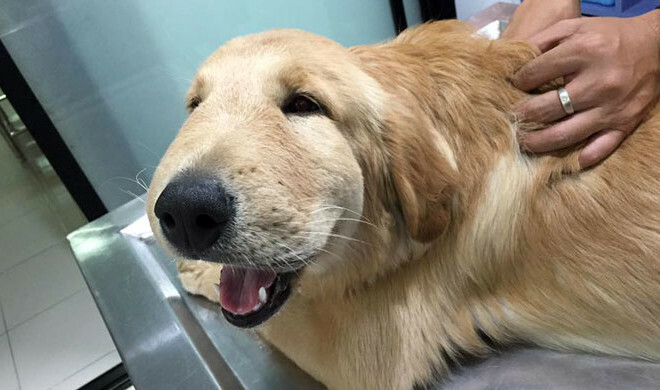 If several days pass and the swelling does not go down, notify your veterinarian. Adapted from Hill’s Pet "How to Handle Dog's Wasp or Bee Sting"